I've been preparing for a 2 person show in Milan that opens in September. I'm very excited about this show and hope to be there for the opening. I love folklore and myths. I wanted to make something for Milan that reflected a bit of where I live and what I love. Seattle is a small city, but one rich with cultural diversity and heritage, especially Native American traditions. This piece is based on the Native American myth of how the Raven stole the Sun and gave light to the world. 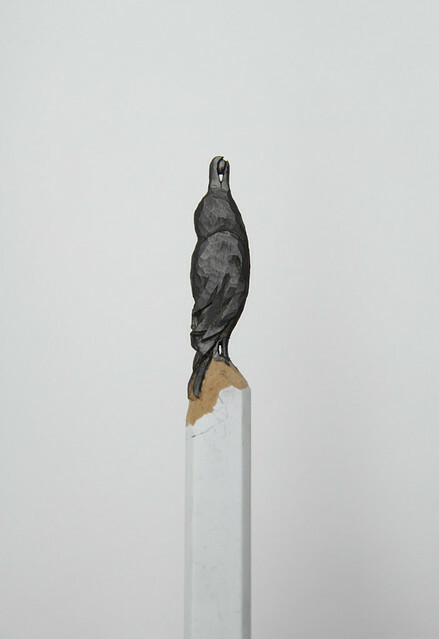 The raven's beak and round bead is carved from graphite, the rest of the bird is carved from the pencil's wood. When I carve graphite everything I touch turns black from the dust. I thought I'd use this to my advantage and coated the bird's body with graphite shaving. I love how shiny and reflective this surface is, almost like a Raven's feather. I feel I have to give a shout-out to one of my favorite folk artist, Dalton Ghetti. I'm a great admirer of his work and the fact that he's self taught. It's difficult to work in such parallel to another artist and not feel self-conscious. I try to make work that is true to the self and reflect my perspective. I feel as an artist you need to put blinders on sometimes and "just do it". Don't think too much or else you'll shatter those fragile ideas, especially in the initial stages. 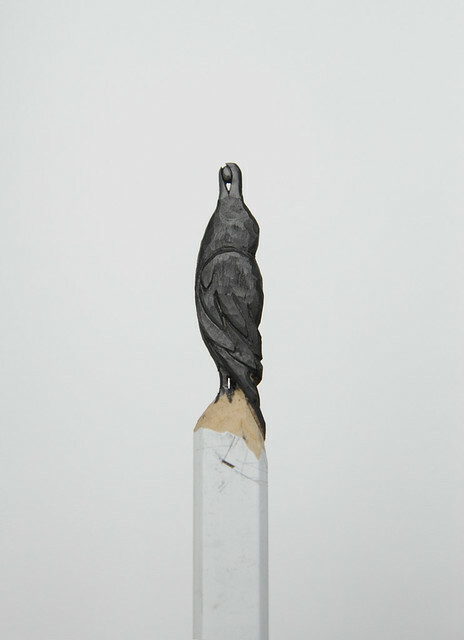 I hope I've brought something new to the pencil carving world. this is beautiful, i think my favourite carving of yours (that i've seen on this blog). i'm a huge fan of ravens and i love that you've coloured it using graphite shavings. very clever. i'd love to see it in person but will be nowhere near milan in september (or any other time soon)! What a stunning piece, love the delicate part of the sun, the movement of the wings and how you used the shavings to give it its coloring! So glad I stumbled upon this, will keep following! I saw these pieces on flickr and immediately thought of Dalton Ghetti who I've admired myself for many years. I really like how you carved from the wood as well and how it took on the graphite, setting it apart from his work and making it your own.